It’s always a good call to use a theme in the making of your new site. Unlike the traditional design & coding approach, you wouldn’t need any technical skills, and you’d also end up spending much less for a handsome-looking result – not to mention that you’d be able to imagine that outcome from the start and take very little time to get there. If you’re wondering where you could find rich WordPress themes, the web is loaded with template libraries and website builders that you may like. The tricky part is deciding on the most cost-effective option that also leaves you with dashing layouts which can be easily customized. That’s why I’d suggest looking into Teslathemes.com. Here’s what I’ve noticed about this source. First off, it has its own framework that enables you to make easy work of personalizing your future site’s appearance and functionality. What is more, whichever theme you pick, it comes with thorough documentation that covers both the installation process, and precious insight into the Tesla framework. In other words, users get full access to shortcodes, settings, and features. Even with all the information handed to you like this, you might still have a setback at some point. In that case, it would be a good idea to turn to the FAQ page and Forum, where so many kinds of user issues are addressed. On top of that, if you need a prompt intervention from the technical support team, testimonials say that someone will come to assist you in a flash. There are 17 themes on this website so far, and their numbers are growing. So, you won’t feel confused about which layout to choose, as each of them is tailored for a specific purpose, and their descriptions tell you whether a theme has what it takes to make you happy. The Responsive WordPress Themes can be used on as many domains as you need, and they are all one click away from being updated every week for free. Tesla has three pricing plans: Starter, Standard, and Developer. Beginners can purchase a single theme for $35, while everyone else can sign up for an annual subscription to all current and upcoming themes in exchange for $45, or $65. Note that the Developer plan grants access to PSD files and is ideal for agencies. As a customer, you can pay with your credit card via Authorize.net, or with your PayPal. On an alternate note, if you partner up with the Tesla Club and link from your website, the affiliate program rewards you with 50% of each sale that was finalized with your help. So, why not embed their link or banner somewhere on your site? The cumulated monthly winnings are sent to your Paypal within the first 5 days of the next month. 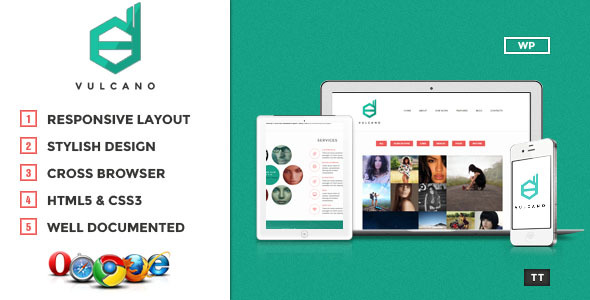 Display is a Creative WordPress Theme with clean, modern, responsive design and a wide set of advanced features. It is packed with lots of stylish components and some great options like: beautiful parallax effect, filterable portfolio, page templates, 12 custom posts, 7 custom widgets, built-in shortcodes and much more. This template is a great choice for a blog, creative agency, online portfolio or any other related website. 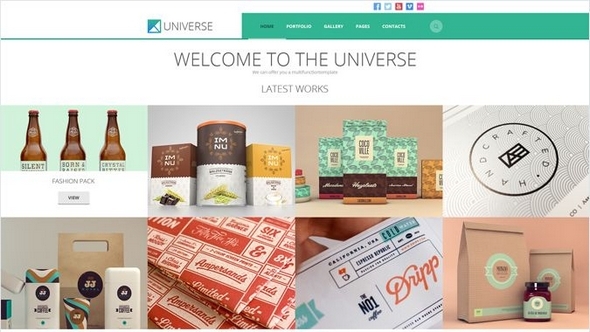 Universe is a Multipurpose WordPress Theme with clean, modern, responsive layout and some of our latest features powered by Tesla Framework. It includes beautiful image sliders, smooth transition effects, filterable portfolio, multiple representations of home page, custom posts, custom widgets and much more. If you have a blog, online portfolio, agency, business website or any other related projects, this template is the best choice for you. 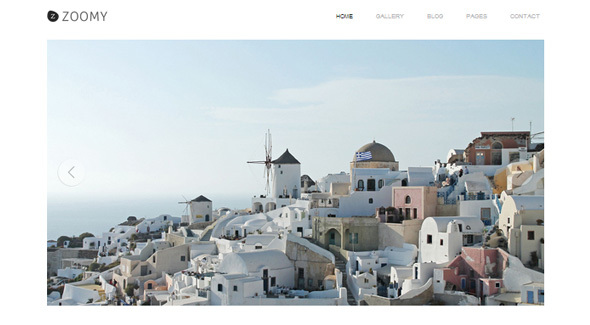 Zoomy is a Professional Photography WordPress Theme with modern, minimalist, responsive design and some great features to make your photography website stand out of the crowd. It is Retina Ready and includes our latest features like: 10 custom posts, 5 custom widgets, WPML compatibility, built-in shortcodes, social media integration, featured video support and more. If you’re passionate about photography and wish to highlight your photos or creative works in a stylish manner, this theme is definitely for you. 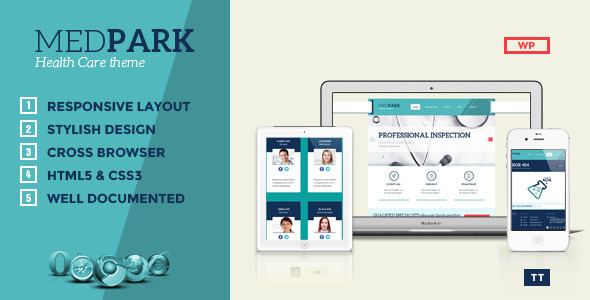 MedPark is a Medical WordPress Theme with clean, responsive design and a wide range of features specially created for health care related websites. It includes various components and options dedicated to medical projects. Some of these include: our doctors page, medical services, appointments, timetable and much more. MedPark is best suited for a blog, hospital, health center, school, university or any other related website. Hudson is an eCommerce WordPress Theme with modern, clean layout and a complete set of features meant to help you easily sell your products. This template is compatible with WooCommerce – the most popular eCommerce plugin for WordPress. It offers a wide range of great eCommerce features like: shopping cart, product management, orders, shipping settings, payment gateways, inventory, and much more. 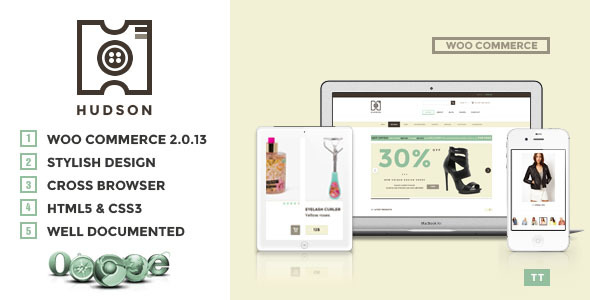 Hudson is the ideal choice for a blog, online catalog, eShop, eCommerce website any other related project. Winterfell is a Creative WordPress Theme with clean, minimalist and responsive design, beautiful galleries and awesome transition effects. Impressive layout, ease of use and creativity are the most suitable words to describe Winterfell – use it to showcase projects in the most creative way. Winterfell is powered by Tesla Framework and includes our latest features like responsive design, stylish galleries, unique CSS3 transition effects, built-in short codes, filterable galleries, etc. 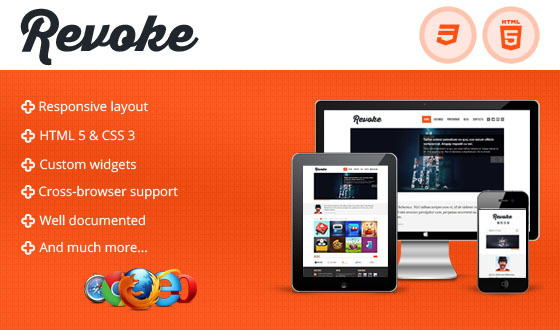 Revoke is a Premium WordPress Theme with clean, modern and responsive design. It is a fully customizable theme that will help you highlight your works in a stylish manner. Revoke comprises powerful features like: beautiful sliders with smooth transition effects, 7 custom widgets, filterable and animated portfolio, built-in shortcodes, social media integration, AJAX contact form and more. This template is great for blogs, portfolio, corporate websites, creative agencies and other related websites. 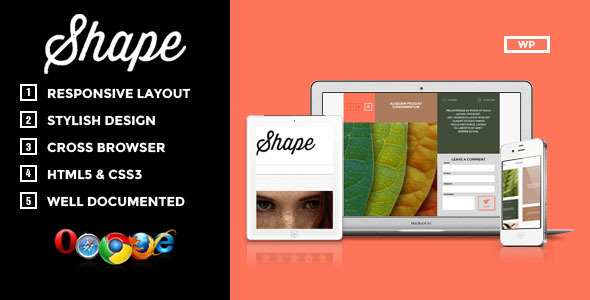 Shape is a Photography WordPress Theme with clean, minimalist and responsive design, beautiful galleries and awesome transition effects. The template is powered by our Tesla Framework and includes our latest features like responsive design, stylish galleries, unique CSS3 transition effects, built-in shortcodes, filterable galleries, custom posts and much more. If you wish to showcase your photos or creative works in a stylish manner, you should definitely get this Theme. Vulcano is a Creative WordPress Theme with clean, minimalist layout, smooth transition effects and advanced features powered by our updated version of Tesla Framework. This theme is packed with our latest features like responsive design with full width elements, built-in shortcodes, filterable portfolio with beautiful components, AJAX contact form and newsletter subscription, and much more. Vulcano is best for a blog, portfolio, creative agency, small business or any other related website. Wedding Day is Premium WordPress Theme that has everything you need to make your wedding ceremony exceptional. It has a stylish layout with responsive design and a rich set of features powered by our Tesla Framework. This Wedding WordPress Theme has a full-width design with smooth transition effects and sliders, a beautiful photo album, dedicated pages for your wedding ceremony, date & place, RSPV form and a stylish blog. Highlight the most memorable moments from your wedding, using this template! 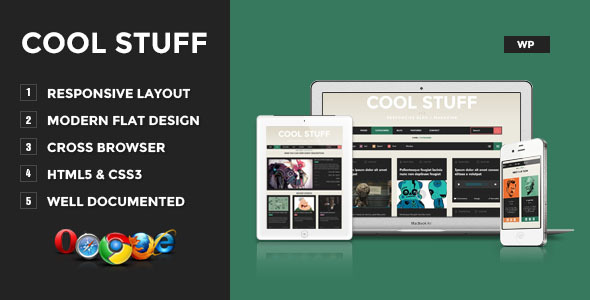 Cool Stuff is a Premium WordPress Theme with modern, flat and responsive design. It includes our latest features and a powerful customization panel to help you personalize and expose your content in a cool way. This template includes our latest features like: custom posts, custom widgets, post format support, events management, built-in shortcodes, beautifull image slider with smooth transition effects, filterable and animated portfolio and much more. Cool Stuff is ideal for a blog, a magazine site, a band, a music related website, a site listing events or any other related website. 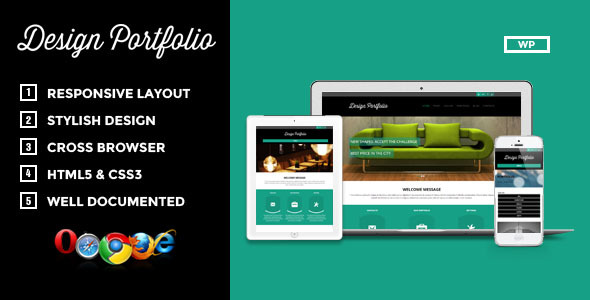 Design Portfolio is a Premium WordPress Theme with clean and modern design, intended to highlight your creative works. It comprises a lot of powerful features like: full width slideshow with CSS3 effects, filterable portfolio with 2,3 or 4 columns, built-in shortcodes, Flickr photostream, social media services integration, AJAX contact form and more. Design Portfolio has 23 predefined pages already created, that coupled with its customization options can be tailored to very specific needs. New pages can be easily created with existing design components. 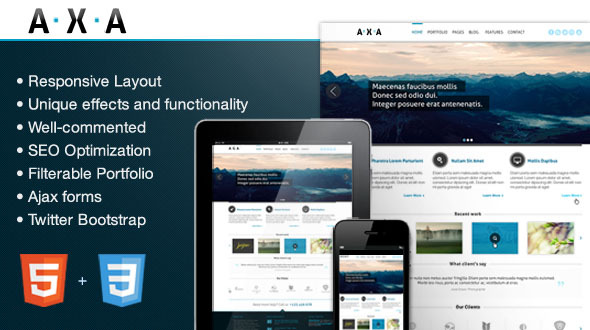 AXA is a Multipurpose WordPress Theme with responsive design and a rich set of features like: beautiful image slider with CSS3 effects, filterable and animated portfolio, shortcodes, 7 custom widgets, AJAX forms, social media integration and much more. 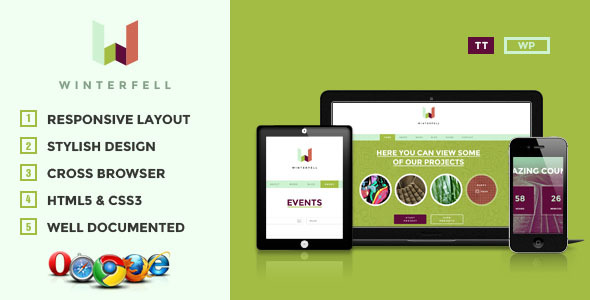 It has an interactive popover showing template’s unique features, a dedicated area for client testimonials and a slider to showcase your recent work. AXA is a Premium WordPress Theme suitable for a blog, portfolio, business or small agency website. SkyWalker is a Premium Design with clean, minimalist and elegant components, meant to showcase your works in a professional manner. It includes a lot of new features like Main Page slider with thumbnails, filterable portfolio with multiple columns, built-in shortcodes, custom widgets, recent posts slider and much more. 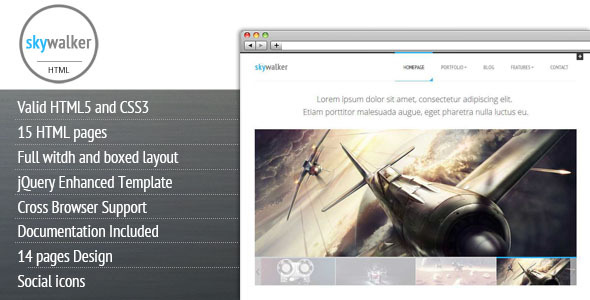 SkyWalker is the best solution for a blog, a portfolio, a small business or a creative agency. It is a fully customizable template, and you’ll be able to tailor its appearance and functionality to your needs. 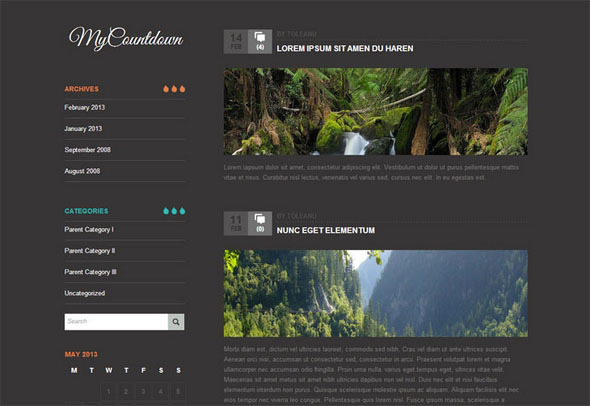 MyCountdown is a clean, minimalist and elegant Coming Soon WordPress Theme with responsive design and cool features. It includes a customizable jQuery countdown, social media pages integration, newsletter sign up form and beautiful HTML5 and CSS3 effects. If you’re building a new website and want to announce your visitors in advance, keep them up to date and leave a positive impression, MyCountdown is the perfect theme for you. 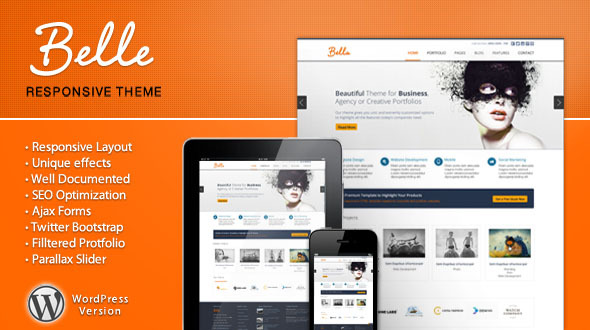 Belle is a Multipurpose Premium WordPress Theme with responsive layout packed with a rich set of features like: Parallax slider, AJAX contact forms, filterable and animated portfolio, 7 custom widgets and much more. It is the best solution for a blog, a portfolio, a corporate website or a creative agency. Its core design elements are completed by smooth transitions and animations, slideshow with CSS3 effects and 12 columns grid.